You can now Book your Columbia Metropolitan Airport Parking and breeze in and out of the CAE parking lots. Columbia Metropolitan Airport long-term Surface Lot Parking at the CAE airport! Book your CAE Surface Lot Parking Now! Parking lots are open 24/7. All vehicles parked in non-designated spaces may be ticketed or towed at the owner's risk and expense. Vehicles parked in any parking lot for more than 30 days will be considered abandoned unless the customer has notified the parking contractor in advance. Abandoned vehicles will be towed at vehicle owner's expense. Please stop by the Exit Plaza or call 803-822-8474 to make arrangements to leave a vehicle in the lot for an extended period. We Offer CAE Surface Lot Parking ONLY. Columbia Metropolitan Airport parking, offers the option of self parking or valet service parking! All CAE lots are well-lit and always monitored, so you can have peace mind knowing that your vehicle is safe and looked after while you're gone. You are not required to make a reservation, but it's encouraged that you do! You can save time and money just by choosing the convenient way of booking a parking space, and guarantee yourself a spot when you get there. There's nothing worse then arriving at the airport, only to be unable to find parking. Avoid the headache and book ahead! Parking is open 24 hours a day, so no matter what time you have to park and fly, we can accommodate! If you are delayed dont stress you can make up the difference when you exit the lot. If your vehicle will be there for more than 30 days let us know by calling CAE Parking at 803-822-8474 so that your car won't get ticketed or towed. Park in the designated parking spaces ONLY to avoid any issues. The Columbia Metropolitan Airport taxi pick-up area is located on the lower level of the terminal in the baggage claim area outside of the doors to the left of the rental car counters. Uber service is available for pick-up/drop-off at Columbia Metropolitan Airport. The Uber pick-up area is located on the lower level of the baggage claim area in front of the parking garage. You may park park anywhere in the surface lot. Note: All vehicles parked in non-designated spaces may be ticketed or towed at the owner's risk and expense. Present your ticket you pulled at the entrance and your InstaPark Printed Receipt and you will be validated and can be on your way. If you overstayed the reservation time the cashier will charge you the difference. I liked that by prepaying I could let the parking lot personnel know how long my car would be left. It was an extended trip out of the country, and I did't want to come back to any surprises. I was pleased when I arrived to pay that the attendant said they were keeping an eye out for me. He and his boss knew a new employee would be coming on duty, and they wanted it to go smoothly for all concerned. I was right on time, and the fee was as prepaid. It was fast, smooth and friendly. Thanks! Left my car there for 18 days came back to the same car. No tickets bumps or scratches. Thank you. Everyone was very sweet and it only took the employee a few minutes to get me processed with my online receipt! Simple to use. Thanks for making it easy. I love how great the staff at the CAE Parking lot are. They are very organized and were expecting me when I arrived at their front desk to check in and made the entire process a very speedy one. Thanks for taking care of me, now time to enjoy my holiday! I love all of the staff at CAE Parking - Columbia Metropolitan Airport - Surface Parking lot. They are really patient and willing to make sure that every one of their customers knows that they matter. The employee at the check-in desk took the time to explain something to me twice because I didn't understand it the way it was explained the first time. two thumbs up for these guys. 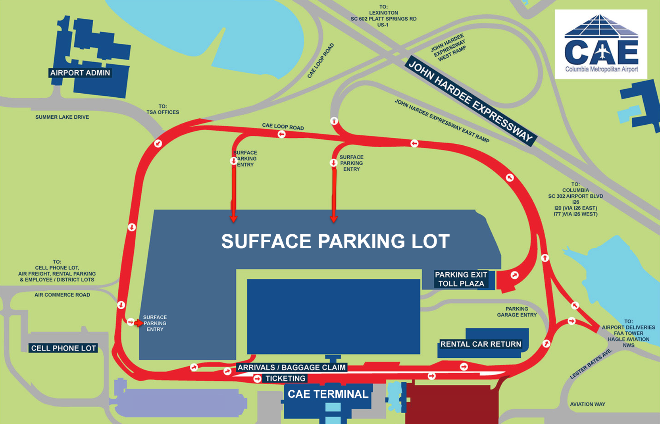 CAE Parking is located in the Columbia Metropolitan Airport property. It is literally just a stone's throw from the terminals and gates. It's really easy to register your car at the front desk, so don't feel like you have to call ahead or make a reservation online if that's not something that you're comfortable with. It couldn't have been any easier to make a reservation online for the CAE Parking lot. Everything on their site is clear and really easy to follow. We will continue to use CAE Parking - Columbia Metropolitan Airport - Surface Parking in the future for the sheer convenience that it offers! CAE Parking - Columbia Metropolitan Airport - Surface Parking is just okay. There's nothing special that stands out about the service that I received at all. They didn't do a terrible job but they also didn't do a great job either. CAE Parking - Columbia Metropolitan Airport - Surface Parking is a great parking lot. The lot is actually part of the airport, so you're not going to find anything closer than this and it's crazy cheap too! Recommend highly as the best option to park long term while you are away on a trip. I'm giving CAE Parking 5 stars! I was very happy to see that when I returned from my trip my car was where I had parked it and that it was in the exact same shape as when I had left. Worth checking out for long-term parking in the future. From now on I am only going to park my car in the CAR Parking lot at the Columbia Metropolitan Airport from now on when I'm going on a vacation. The entire facility was very well taken care of and made me want to leave my car with employees who care about me and my car, completely. I was going away on business that was going to have me out of the country for almost 5 straight weeks and wasn't crazy about leaving my car parking at home where really there was no one to watch over it so I decided to use CAE Parking when I flew out of the Columbia Metropolitan Airport. Great job taking care of my car! Check them out, totally worth it! Not a single complaint here. CAE Parking - Columbia Metropolitan Airport - Surface Parking was really good. The staff really work hard and making sure that you are happy with the service that you are receiving. Thanks so much for looking after us, we will see you again the next time that we travel. My experience with CAE Parking - Columbia Metropolitan Airport can best be described as incredible! These are employees who care about their customers and work endlessly to ensure that when a customer leaves the airport at the end of their vacation they are happy with their entire experience. I wanted to use a long-term parking lot that was going to be convenient first and foremost and then hopefully has other good qualities that went with it when I was planning my trip. Finding CAE Parking - Columbia Metropolitan Airport was the best thing that could have happened! It is right at the airport, had valet parking if you choose to use it and has wonderful staff to help you along the way. So glad I chose to use them! CAE Parking - Columbia Metropolitan Airport always has great service. It is usually the most painless part of my vacation. The drivers always help with loading and unloading my bags which is a huge help. I would highly recommend these guys, they will take care of you like no other long-term parking lot. Everything at CAE Parking - Columbia Metropolitan Airport - Surface Parking was exactly what I was told that it would be. Sure there isn't an added car detailing or another service like that but I don't really need it because of the wonderful service and the safe parking lot that I get to leave my car in while I'm away. Parking in the CAE Parking lot was okay. The only thing we would change is the wait for the shuttle on our way back from our vacation. We could have walked back faster but it would have been nearly impossible with all of our luggage and our kids. I was driving to the airport and wasn't able to find the parking lot that I had made a reservation for so I decided to park as close to the airport as possible because I had wasted so much time driving around. That's how I came to use CAE Parking - Columbia Metropolitan Airport - Surface Parking. This was the best thing that could have happened to me! Friendly staff, cheap parking and 2 minutes to get to the terminal for my departure. I love not having to worry about my car when I'm away on vacation. It means that I can actually enjoy myself when I'm away and I can truly relax. Thank you to the wonderful staff at CAE Parking for always taking great care of my car and me! I will recommend you for sure to my friends and family. Everyone at the CAE Parking - Columbia Metropolitan Airport lot were friendly and very nice to me. I got to the lot, pulled my car near the check-in and the staff took it from there. All I needed to do was jump onto the shuttle that was right there waiting for me and off I went. This was my first time using CAE Parking - Columbia Metropolitan Airport - Surface Parking and I can say without a doubt that it won't be my last. The shuttle services are prompt and convenient to catch. The drivers a very helpful, kind and will insist on loading and unloading your luggage for you! Love feeling that royal treatment love! I have been using CAE Parking - Columbia Metropolitan Airport parking lot for quite some time now and because I travel often I needed to find a parking lot that wasn't going to screw me over. This is the only lot that has been able to deliver oh and the price is far cheaper than other lots that I've used in the past. Using the CAE Parking - Columbia Metropolitan Airport parking lot was a really easy service to use from start to finish. It's surprisingly cheap too! I will strongly recommend this lot to all of my friends and family in the future. So happy with every part of my parking experience here. I've had so not so good experiences in the past using other parking lots near the airport but not this time with CAE Parking - Columbia Metropolitan Airport - Surface Parking. Every part of it was great and I am actually looking forward to parking here again. Thanks so much for everything! I couldn't believe that being so close to the airport I could find parking that was cheap. That it was actually affordable to park there for the entire time I was away, which I did not expect at all. I highly recommend you check out the CAE Parking - Columbia Metropolitan Airport - Surface Parking lot the next time you need parking, you won't be disappointed. Everything about using the CAE Parking - Columbia Metropolitan Airport - Surface Parking was easy peasy. It's been an experience that is worth having yourself when you need long-term parking while you are away on a vacation. The price may be what got me to use the CAE Parking - Columbia Metropolitan Airport parking lot but the 5 star service is what is going to be bringing me back again and again. I would give CAE Parking - Columbia Metropolitan Airport - Surface Parking 5 stars! This is the lot to use when you're looking to park your car while you're traveling. I would recommend using CAE parking to all of my family and friends. I don't like to just leave my car anywhere so it is important to me that I use a lot that I could trust and I get that with the CAE Parking - Columbia Metropolitan Airport - Surface Parking lot. The staff are helpful and friendly and will do almost anything so that everything goes smoothly. 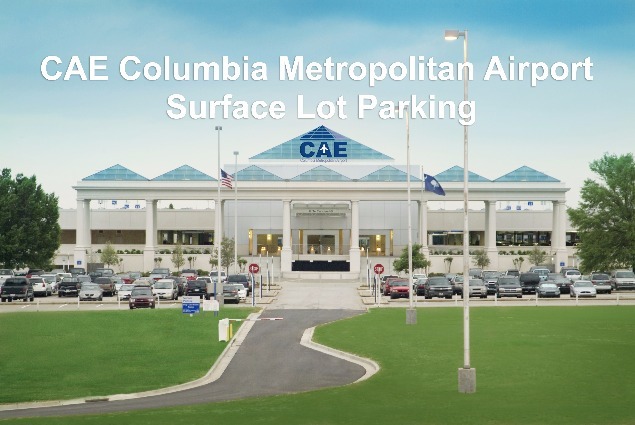 CAE Parking - Columbia Metropolitan Airport - Surface Parking is really easy to use. I dropped off my car, hopped on the shuttle right away and got dropped off at the airport in no time. When I got back I called for the shuttle the minute we landed and they were there ready for us by the time we got through security and grabbed our bags. Highly recommend! I've been telling people all about the fantastic experience I had using the CAE Parking lot when I flew out of the Columbia Metropolitan Airport a few weeks ago. I will be back! This is probably the best airport parking lot I've used yet. The service was great, all of the staff went above and beyond my expectations and really took care of me. I would strongly recommend CAE Parking - Columbia Metropolitan Airport to park your car if you're looking for long-term parking at the airport. If I could give CAE Parking - Columbia Metropolitan Airport - Surface Parking a higher than 5 star rating I would! The manager that was working the front desk answered all of my questions and put my mind at ease about leaving my car with them. Use the valet service, it's totally worth it! Excellent lot, completely safe so you don't have to worry about your car. CAE Parking lot is safe, you're leaving it with great people who care about you and taking care of your car. 5 plus stars for sure! CAE Parking - Columbia Metropolitan Airport - Surface Parking is easy to get to and once you get to the lot there are more than enough staff at all times to help you unload your bags from your car and into the shuttle. It's completely hassle free and then you're on your way to enjoying your holiday without having to worry about your car. I can't get over how great everything was with my experience at CAE Parking - Columbia Metropolitan Airport lot. The staff took care of me immediately from the moment I pulled into the parking lot. The shuttle picked me up quickly and dropped me off right where I needed to go. Thank you so much for caring, I will absolutely use the CAE Parking lot again. The staff that works at the CAE Parking lot offer some of the best customer service I've ever had. Everyone made sure that I had a great experience from when I dropped my car off to when I returned from my trip to pick it up. Thanks so much to everyone who works at CAE! It's often difficult to find good parking near Columbia Metropolitan Airport but then I found CAE Parking. It's so easy to make your reservation online and doing so ensures that you will have a guaranteed spot to park. Absolutely the easiest parking experience I've had to date. CAE Parking is such a great lot for a very affordable price too! It cost me almost half of what I've paid in the past at another lot. There's no other long-term parking that I will use anytime in the future. Two thumbs up and a 5 star rating from both my husband and myself. Everything about my expereience with CAE Parking - Columbia Metropolitan Airport was absolutely fantastic. I will only use this lot from now on, it's the only one that makes sense. Not a single complaint about any part of my interaction with the staff or how things went. The CAE Parking lot is in the best location. I wasn't sure what to expect at first but I'm so happy that I decided to give it a shot. I usually park at a different lot but won't any more. Great location, service and price! CAE Parking has one of the best prices I've seen for long-term parking at the Columbia Metropolitan Airport. What makes the entire experience even better is how great the service is on top of it all. This is a lot that I will park in again because every staff member that I dealt with went out of their way to make sure everything went smoothly. The CAE Parking lot at the Columbia Metropolitan Airport will be the only parking lot that I will ever use again when I need to park my car while I am away on vacation. The staff is wonderful, they treat all of their customers like VIPs and make sure that you get the best service possible. Great service! The CAE Parking lot is actually located at the Columbia Metropolitan Airport itself. The shuttle literally took less than 2 minutes to get us where we needed to be. We will use them again for any trips we take in the future. Highly recommend using CAE when you travel again. I would highly recommend parking at the CAE Parking lot. The lot is right at the airport, the shuttles are fast and run often and the staff including the manager work hard to make sure you have a great experience overall. This is the only lot to choose to park your car while you're away on vacation! I would recommend to family and friends that they use the CAE Parking - Columbia Metropolitan Airport. Everyone that we dealt with was great and our car was well taken care of. A 5 star rating from both of us! Our daughter suggested that we park at the CAE Parking - Columbia Metropolitan Airport when we were headed on vacation and we are both so glad that she did. Very impressive experience. The staff was organized and easy to work with both at drop off and pick up. Great long-term parking lot. I was happy with how easy the entire check in, drop off pick up and check out was. I thought that it was going to be far more complicated than it actually was. The staff is great, very friendly and so helpful which made it great to know that I was leaning my car in good hands. Two thumbs up from this gal! I was really impressed with this lot, it was clean, there were plenty of staff to help us when we pulled into the lot to park. There were lots of lights which helped to make it easy for the staff to see and monitor cars so that they were safe while vacationers like my wife and I were away. We will be telling all of our family to park in the CAE Parking lot the next time they are flying out of Columbia Metropolitan Airport. The price to park at the CAE Parking lot was perfect and can't be beaten by any of the surrounding lots. I reserved my spot online as soon as I knew where and when I was traveling to make sure that everything would run smoothly and it did! EVERYTHING was great! I've been telling everyone I know to park in the CAE Parking - Columbia Metropolitan Airport. It's cheap as heck, the staff that work there are all amazing and you can't get any closer to the airport if you tried! I can't believe that I just figured out how little it actually costs to park at CAE Parking right at the airport. I thought for sure it was going to cost me $20 a day but it didn't! It was so cheap and every part of my experience was great too! 5 star parking without a doubt! So glad that I decided to use CAE Parking - Columbia Metropolitan Airport to park my car for the week while I was away on vacation. I was surprised at how great the service was and how well everything went from start to finish. Worth using for sure and I will recommend it to anyone looking for long-term parking when traveling from the airport. 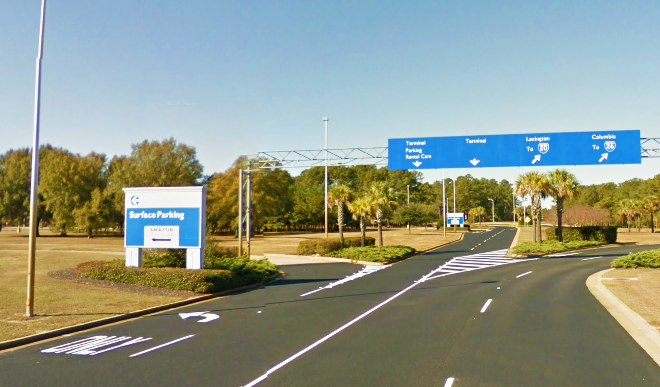 The parking at CAE Parking - Columbia Metropolitan Airport is so cheap I was shocked when I found out just how little it was actually going to cost me to park there while I was away on vacation. I have to say that it's totally worth it and I will use it again whenever I travel. All of the staff that work at CAE Parking are great! They are very friendly and willing to answer any of your questions. I've never had any problems and will continue to use them in the future whenever I travel for business or pleasure. Thanks so much for making sure I have a place I can trust to park while I'm away. The check in and check out process was fast and easy. When we caught the shuttle it was a short ride to the terminal and we were dropped off at the door closest to our airline. Even better is that our car was safe the entire time that we were away in a well-lit parking lot so we didn't have to worry about it while we were away. I love that the staff at the SAE Parking is so great! They are all helpful and more than willing to help you in so many ways. They will park your car for you, load and unload your bags and even make sure you crack a smile or two along the way. Highly recommend using CAE Parking at the Columbia Metropolitan Airport for your next trip. I have used CAE Parking at the Columbia Metropolitan Airport many times now and it is great. I've never had any issues and it's very affordable to park there too. The valet service it the best that I've used yet. I would recommend CAE parking to anyone. I have used CAE Parking - Columbia Metropolitan Airport and would recommend using the valet service as well as reserving online ahead of time to speed up the entire process. Both pick up and drop off are smooth and there are never any problems. Worth using for sure! CAE Parking - Columbia Metropolitan Airport offers the best long-term parking around. Excellent shuttle service to and from the terminal. CAE Parking - Columbia Metropolitan Airport offers great service all around from start to finish. We have been using them for quite some time now and will continue to use them in the future. We have used CAE Parking as our parking option every time we fly and haven't had any problems. Dropping off your car is easy and then picking up when you return is just as easy. The shuttle only took a few minutes to get us where we needed to go and when we came home it was actually waiting to pick up up! Great service all around! CAE Parking is great. It's fast and so easy to use. Drop off, check in, pick up and check out ran completely smoothly without any troubles. Highly recommended service to use. We just went on a fabulous trip for our 10 year wedding anniversary and tried the CAE Parking for the first time. We used the valet service and didn't know what to expect. When we pulled into the lot we were quickly greeted, got checked in and had our car valet parked so that we didn't have to worry about it. The shuttle took us directly to out terminal and gate with now stops in between. What was great is that we weren't stressed about anything and we got where we needed to be on time. CAE Parking - Columbia Metropolitan Airport is a good option for cheap long-term parking. We have been using it with no problems for several years now and always get to our airport check-in quickly with tons of time to spare. We would recommend it to anyone who is flying out of Columbia Metropolitan Airport. The shuttle drivers are what makes CAE Parking - Columbia Metropolitan Airport the best that there is! They happily load you into the shuttle and unload it for you as well. I love that they had a great sense of humor as well, it makes a stressful time far less stressful. I will recommend CAE Parking to all of my friends when they are looking for long-term parking. CAE Parking - Columbia Metropolitan Airport is a great choice for long-term parking. The rates are the cheapest around and the lot is safe. If I could give them more than 5 stars I would for sure. Very happy with my experience once again. CAE Parking offers the best value in parking around. It's the closest to the airport. It's fast to get where you need to go and the entire staff is wonderful. They are what makes this my go-to for parking when I am traveling anywhere! The service is always excellent with CAE Parking. The valet service is worth using, it's always quick and easy to use. The shuttles are always available and ready to drop you off or pick you up. I would recommend using CAE Parking when you're planning your next trip from the Columbia Metropolitan Airport. CAE Parking - Columbia Metropolitan Airport was great! The shuttles run often and you never have to wait very long at all. The staff all seem to really care about you, they don't just treat you like another faceless number. These guys are worth using, I highly recommend them. Parking with CAE Parking is very convenient. It's quick, easy and painless to use check in and out and to use the shuttle as well. All of the staff that we dealt with were wonderful and very nice too. This is a great option for long-term parking when you're headed on a vacation. My experience with CAE Parking - Columbia Metropolitan Airport was really good. We got a shuttle right away after checking in. They dropped us as close as possible to our airline counter and got us there with time to spare. Shuttle upon our return was actually waiting for us which was great too. We have already told several friends and family all about CAE Parking. It's cheap to park at CAE Parking - Columbia Metropolitan Airport. The service is great and makes it worth parking here. The staff working are helpful and very accommodating, they go out of their way to help you and get you on your way quickly. I would recommend this lot for sure to anyone traveling from the Columbia Metropolitan Airport. Everything is always great when I use CAE Parking. The staff is very friendly, helpful and willing to help to make sure you have a pleasant experience from start to finish. I highly recommend that you use CAE Parking - Columbia Metropolitan Airport when you're planning your next trip, you won't be disappointed. It's fast and easy to book parking online in the CAE Parking - Columbia Metropolitan Airport lot and you get the best price guarantee too! Totally worth using and you get to save money while you're at it! You won't regret booking your next parking stay here! We used valet parking when we parked our car at CAE Parking - Columbia Metropolitan Airport because our flight left at 4.30 am and we got back at 1:30 am. Using the valet was so great and worth it! We will definitely use it again for future flights. Thanks for everything! Ther service at CAE Parking was far better than I could have imagined. The staff is all quite friendly and helpful. The parking lot is open 24/7 which was great since I had to catch a flight at 3:30 in the morning. I would give this place 5 stars. CAE Parking - Columbia Metropolitan Airport always offers fast service, shuttles and an overall easy to use facility. Love that it only takes a few minutes to drop off my car, check in and get to the airport terminal that I needed to be at. I would strongly recommend you give them a try. I always park at the CAE Parking - Columbia Metropolitan Airport. The rates are the best that I've seen, the staff is always friendly and willing to go that extra mile to help you and it only takes a few minutes to get to the airport terminal that you need. Highly recommend checking them out. Valet parking at the CAE Parking - Columbia Metropolitan Airport is great and you can't beat the price, completely affordable! I will use them again for my next trip and will recommend them to family and friends in the future. Thanks for everything! Checking in and out with CAE Parking is very easy. Once checked in we grabbed the shuttle to the airport terminal and we were dropped off close to our airline desk. We really liked that our car was ready for us when we got back from our vacation, it makes everything so much faster. Thanks for everything CAE Parking! When we go to the airport we always use CAE Parking and get the valet service every time. Vehicle drop off and pick up are always easy and there are always shuttles that are waiting to take you to your terminal quickly. The drivers are friendly and help you load your luggage too. We recommend them to everyone we know! We have used CAE Parking - Columbia Metropolitan Airport several times now and every time it has been great! We've never had any problems and it's cheap too!